Plato can be used to manage things that are external to your computer, such as books, household or business inventories, photographs, and the like. 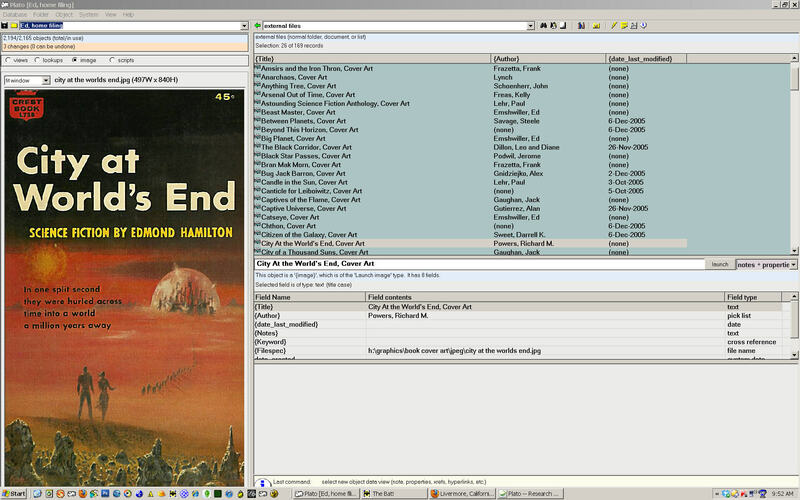 The screenshot above depicts a home filing database that contains a list of lurid covers from 1960s science fiction paperbacks. The book covers were scanned to seperate jpeg files and imported into Plato as image objects. Each image was then associated with it's parent book so that the book's bibliographic entry was linked to its cover. By selecting the 'image' display in the view/lookup pane, the images are displayed as you scroll through the folder. When Plato is used to manage household or buisness inventories, scripts can be written to export the inventories to spreadsheets for numerical analysis and charting.